Looking for bluegrass music in San Diego? You're in the right place! 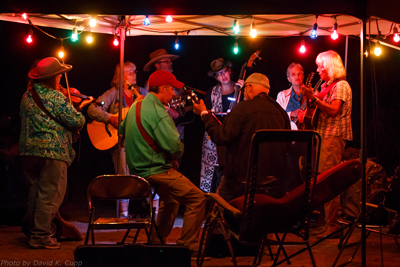 The San Diego Bluegrass Society sponsors a wide variety of bluegrass music events, including regular Tuesday events with open mics and jam sessions for San Diegans and visitors who desire to play bluegrass in a group setting, with a featured band on the 4th Tuesday. 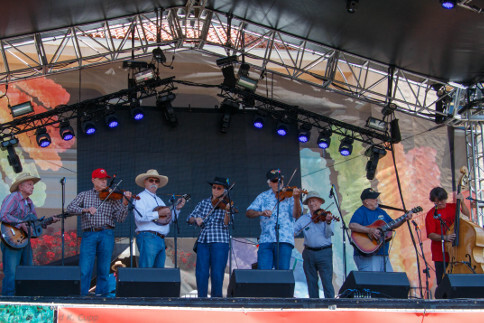 SDBS also sponsors bluegrass concerts by nationally recognized bands touring through our region, along with workshops and other educational activities. SDBS is pleased to welcome back The Full Deck as Featured Band for April 2019. John Deckard, band leader, jaw harp, and harmoinica player, fronts The full Deck as one of the longest running bluergass groups in San Diego. You can expect great traditional bluergass, some off center preseentations, and humor thoughout! The 2018 Summergrass event is gone except for great memories. We are already plannig and looking forward to next year's event. .Visit the Summergrass website for info. SDBS has an active music outreach program with Emma’s Gut Bucket Band, bringing bluegrass music and instruction to public and private schools, senior centers, assisted living facilities, homeless centers and the like at no cost. We also offer a lending library of instructional materials, plus an instrument lending Library, to our members. 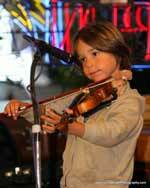 An instrument donation program is also available. Send us an email for info: info@sandiegobluegrass.org. Bluegrass Day at the Fair June 10, 2018 in photos. 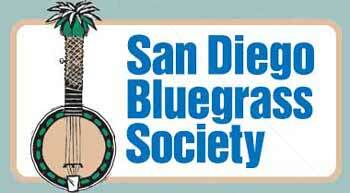 SDBS (originally the San Diego Bluegrass Club) has been a force for bluegrass music in San Diego since the 1960s. For a fascinating glimpse into its storied past, illustrated with lots of photos and historical images, and chock-full of interesting anecdotes and memories, download A Brief History of the San Diego Bluegrass Society (in print-friendly PDF format). 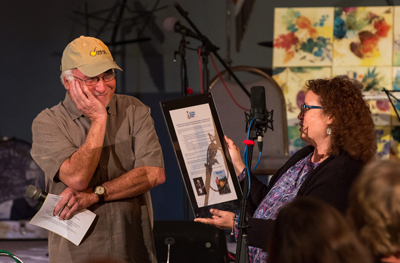 Wayne Rice honored for 40 years on the air with his Bluegrass Special on KSON Radio. Read the SDBS proclamation honoring Wayne. 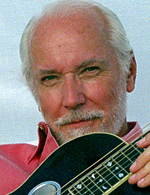 Dobro great Mike Auldridge passed away on Dec. 29, 2012, one day before his 74th birthday. Visit the Mike Auldridge Tribute site to learn more about MIke: his 2012 National Endowment for the Arts National Heritage Fellowship; his 2007 IBMA Distinguished Achievement Award; and his significant contributions to the Dobro and to bluegrass music.. Rob Ickes' moving eulogy is also posted there, along with a guestbook with hundreds of tributes from his friends and fans. Looking for a bluegrass band for your event? Let us know, and we'll assist you in locating a band that meets the particular needs of your party or event. Contact: info@sandiegobluegrass.org. Click here for a copy of the SDBS annual report to members for 2017. It reviews our activities over the 2016 year, including our events and finances. This is a public docuiment. If you are not already a member, please consider joining us for 2017. It's only $20 for the whole family for the year. Click here to join online with your Paypal account or credit card. You won't regret it!